Journey North engages students and citizen scientists around the globe in tracking wildlife migration and seasonal change. Participants share field observations across the northern hemisphere, exploring the interrelated aspects of seasonal change. In addition to monarchs, Journey North tracks the migration of several other species, including hummingbirds, robins, gray whales, whooping cranes, bald eagles, and tulips. Data Availability: Contact Journey North for data access. Protocol Notes: Observers log in to the website and report when they see the first adult, milkweed, egg/larvae of the spring season. In fall, observers can report roosts and adult migrants. Anecdotal, non-migratory sightings can also be reported and this includes any winter breeding. Flockhart DTT, Pichancourt JB, Norris DR, Martin TG. 2015. Unravelling the annual cycle in a migratory animal: breeding-season habitat loss drives population declines of monarch butterflies. Journal of Animal Ecology 84: 155-165. Batalden RV, Oberhauser KS. 2015. Potential changes in Eastern North American monarch migration in response to an introduced milkweed, Asclepias curassavica in Oberhauser KS, Nail KR, Altizer SM, eds. Monarchs in a Changing World: Biology and Conservation of an Iconic Insect. Ithaca, USA: Cornell University Press. Nail KR, Batalden RV, Oberhauser KS. 2015. What's too hot and what's too cold? Lethal and sub-lethal effects of extreme temperatures on developing monarchs in Oberhauser KS, Nail KR, Altizer SM, eds. Monarchs in a Changing World: Biology and Conservation of an Iconic Insect. Ithaca, USA: Cornell University Press. Flockhart DTT, Wassenaar LI, Martin TG, Hobson KA, Wunder MB, Norris DR. 2013. Tracking multi-generational colonization of the breeding grounds by monarch butterflies in eastern North America. Proceedings of the Royal Society B-Biological Sciences 280: 8. Howard E, Davis AK. 2012. Mortality of migrating monarch butterflies from a wind storm on the shore of Lake Michigan, USA. Journal of Research on the Lepidoptera 45: 49-54. Davis AK, Nibbelink NP, Howard E. 2012. Identifying large-and small-scale habitat characteristics of monarch butterfly migratory roost sites with citizen science observations. International Journal of Zoology 2012. Howard E, Davis AK. 2011. 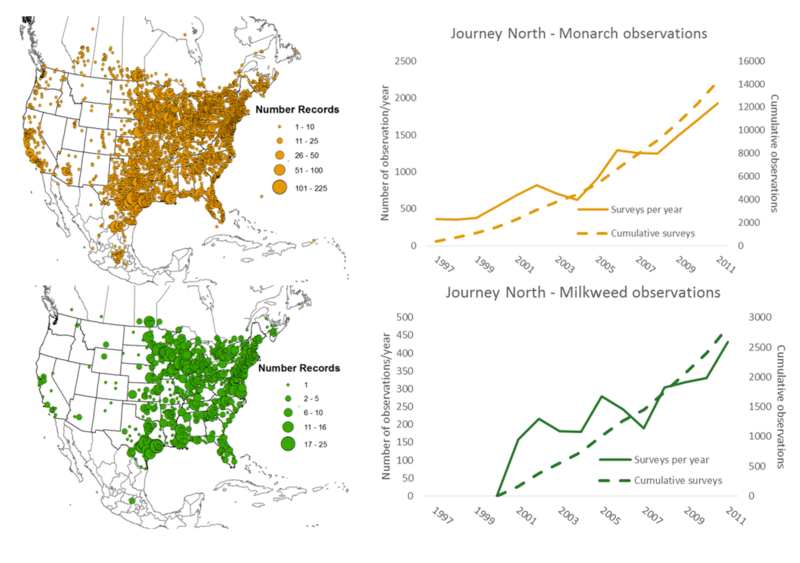 A simple numerical index for assessing the spring migration of monarch butterflies using data from Journey North, a citizen-science program. Journal of the Lepidopterists Society 65: 267-270. Howard E, Aschen H, Davis AK. 2010. Citizen Science Observations of Monarch Butterfly Overwintering in the Southern United States. Psyche: A Journal of Entomology Vol. 2010, Article ID 689301, 6 pages. Howard E, Davis AK. 2009. The fall migration flyways of monarch butterflies in eastern North America revealed by citizen scientists. Journal of Insect Conservation 13: 279-286. Davis AK, Howard E. 2005. Spring recolonization rate of monarch butterflies in eastern North America: new estimates from citizen-science data. Journal of the Lepidopterists Society 59: 1. Feddema JJ, Shields J, Taylor OR, Bennett D. 2004. Simulating the Development and Migration of the Monarch Butterfly. Pages 229-240 in Oberhauser KS, Solensky MJ, eds. The Monarch Butterfly: Biology and Conservation. Ithaca: Cornell University Press. Howard E, Davis AK. 2004. Documenting the Spring Movements of Monarch Butterflies with Journey North, a Citizen Science Program. Pages 105-116 in Oberhauser KS, Solensky MJ, eds. The Monarch Butterfly: Biology and Conservation. Ithaca: Cornell University Press.